Authors: Farhoud, M.; Ferrera, J.; Lochtefeld, A. J.; Murphy, T. E.; Schattenburg, M. L.; Carter, J.; Ross, C. A.; Smith, H. I.
Abstract: Magnetic information storage density has increased at the rate of 60% per year for the past seven years. There is wide agreement that continuation of this trend beyond the physical limits of the continuous thin-film media currently used will likely require a transition to discrete, lithographically defined magnetic pillars. 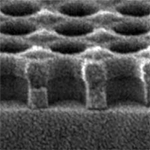 Interference lithography (IL) appears to be the most cost-effective means of producing two-dimensional arrays of such pillars. IL can rapidly expose large areas with relatively simple equipment, without the need for a mask, and with fine control of the ratio of pillar diameter to period. We show that negative-tone imaging yields three times the contrast of positive-tone imaging for the generation of holes in photoresist, suitable for subsequent deposition or electroplating of magnetic material. We use a negative i-line, chemically-amplified resist (OHKA THMR-iN PS1) to form 200 nm period arrays of magnetic dots in Co and Ni. Such arrays, with a variety of well controlled diameters, are used to study the effect of particle size on magnetic behavior.